Soothing Touch has worked with massage therapists for the past 30 years to create the highest quality professional massage products available. Our complete line reflects our dedication to quality and includes Massage Creams, Salt and Sugar Scrubs, Oils and Lotions. Save Big on select Soothing Touch Products: 15% off Calming, Balancing and Muscle Comfort Cremes and 15% off Scrubs now through September! Soothing Touch Fragrance Free Oil 128 oz. Soothing Touch Fragrance Free Lite Oil 128 oz. 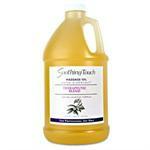 Soothing Touch European Lavender Oil 128 oz. 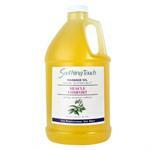 Soothing Touch Sports Blend Oil 128 oz.